Bahia was one of the first hotels on Medano Beach. The property on which Bahia was constructed had the been the home of fisherman Oscar Montaño Herrera. Known as Don Yoka, Herrera was a pioneer of Los Cabos’ fishing industry. When the land on which he resided became available, developer Juan Esquivel saw an opportunity: build accommodation and welcome the world to experience the perfection of Medano. The opportunity seen by Mr. Esquivel was equally appealing 20 years later, when a group of investors from New York purchased the hotel in 2007. Medano had changed in the intervening years – hotels and other tourism infrastructure had risen around it, and Cabo was booming. Even without its unobstructed ocean views, the American investors saw Bahia for what it was: pure potential, in one of the most ideal locations imaginable. An opportunity not to be passed up. What was meant to be a real estate development changed as the American economy went into the recession. The partnership decided on a Plan B: reposition the hotel and capitalize on the potential of the Bahia with a team that would make the hotel unlike anywhere else in Cabo. Managing Director Felipe Rebelo, along with on-site partner Lee Vosburgh, rolled up their sleeves and got to work. A decade later, their hard work has resulted in a brand family that’s attracted adventurous, sophisticated guests from all over the world. Keeping the original name in homage to its history, the revamped hotel reopened in 2010, with the addition of Bar Esquina. The Bahia team knew the hotel needed a quality restaurant/bar – the kind of place that would attract not only guests of the hotel, but visitors from all over Cabo. The kind of place they would want to hang out, night after night, wherever they were in the world. For locals and visitors, Bar Esquina has become exactly that. 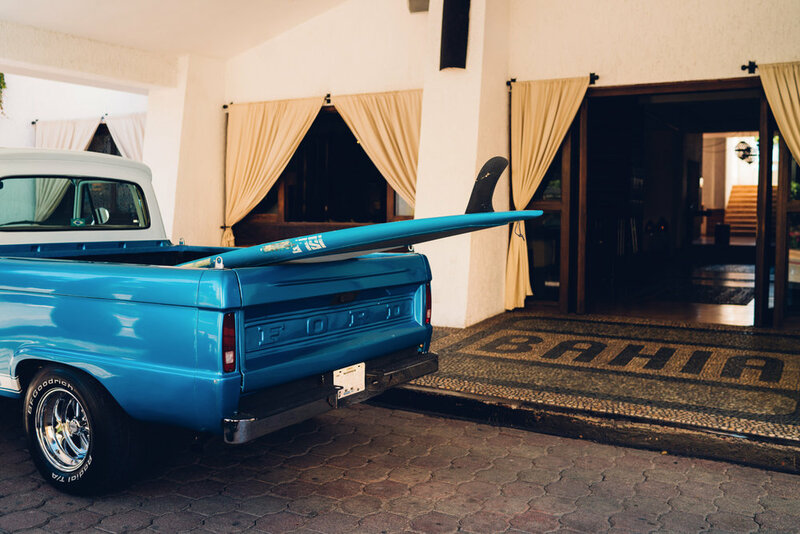 The brand family grew bigger – and even better – in 2016, when the Bahia team seized another opportunity: revamping the iconic Las Palmas, one of Los Cabos’ original palapa-style beach clubs. The beachfront property allowed Bahia to offer guests something they’d been missing: direct access to the swimmable shoreline of Medano Beach. Las Palmas was reborn as Sur, with a chic open-air restaurant offering some of Cabo’s best food and best views, and a relaxed but chic beach club for Bahia guests – and visitors from all over the area – to enjoy. SUR has allowed Bahia to expand its event offerings, including hosting weddings and other celebrations with unbeatable views. SUR has also proven the perfect base for Cabo SUP, which provides stand-up paddle boards and guided tours to guests wanting to experience the Sea of Cortez on a board. Lee and Meredith have long been paddlers, and they’ve been happy to have the opportunity to share their passion for paddling – the best way to experience the iconic Cabo arch – with Bahia’s guests. Not bad at all for Plan B.